I take a gazillion photographs a year and if you walked into my house, you wouldn’t even think I owned a camera because I have no photographs on display anywhere in my house. I have some sort of block that prevents me from actually putting a photo in a frame and hanging it up on the wall, so my walls are mostly just a blank mess. I’ve never ordered a photo on canvas before, it’s too much pressure, I can’t even decide what photo to print and put into an album. Easy Canvas Prints offered to send me a custom canvas and after looking through my photos, I agreed. I had just the photo for it, my most favorite photo of my children that I have ever taken. The 16×20 canvas is gorgeous. It’s hanging in the dining room right now because as soon as it arrived, I opened the package and wanted it up on the wall immediately. I took down the painting that was hanging here to see how the canvas looked on the wall (apologies to my grandmother’s painting). 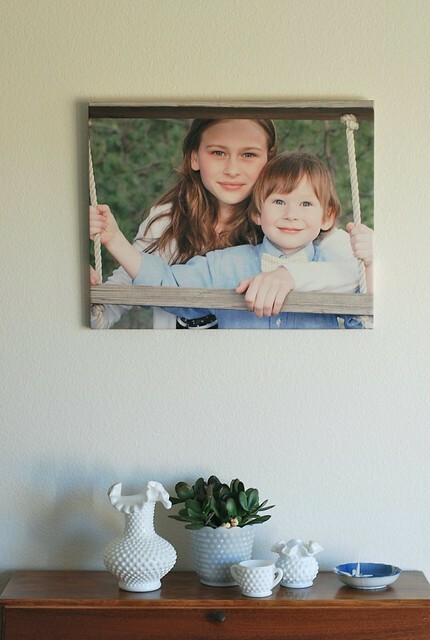 With Easy Canvas Prints, you can also print your Instagram photos onto a canvas. You can upload your photo directly from your Instagram account, such a great idea. Easy Canvas Prints is graciously giving away one 11×14 canvas print to one of my readers. To enter, check out Easy Canvas Prints and leave a comment on this post letting me know about your favorite photo. Be sure to like Easy Canvas Prints on Facebook for info on giveaways and specials. This is going to come as a huge shock to you, but I don’t enjoy cleaning anything the bathtub. I forget about it until I am actually taking a shower and I look around while I’m waiting for my conditioner to detangle my hair and I think to myself, “Wow, this is a really dirty bathtub” and then I go one with my life. Meanwhile, the tub is still covered in dirt. I saw a recipe for Homemade Shower Cleaner recently on Pinterest and I thought I would give it a try. I kept putting off making it until we ran out of our Mrs. Meyer’s shower cleaner that doesn’t really work worth a damn, but it smells nice. And when I say it doesn’t work worth a damn, I put no actual effort into cleaning the tub. I expect to spray it in there and then it just clean the tub like magic. So, really I’m the one with the problem. 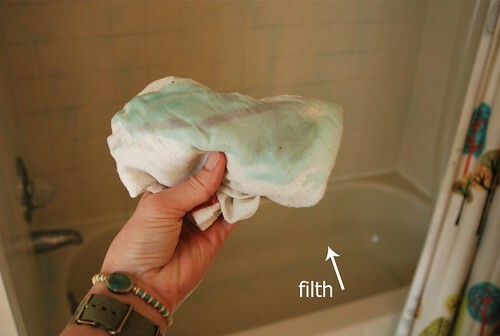 This Homemade Shower Cleaner is legit, you guys. It’s the shower cleaner for lazy people. Mix one cup of warm white vinegar + one cup of Dawn dishwashing liquid into an empty spray bottle and shake. 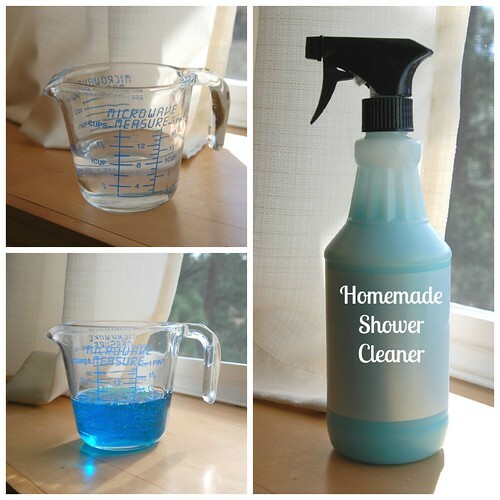 Congrats, you have just made homemade shower cleaner. You only need to have the vinegar warm when you initially mix the cleaner, you are good to go. Spray it all over your shower, more or the extra dirty parts, wait 15 minutes, and behold the filth melts away right before your eyes. Trust me when I tell you our bathtub was gross. 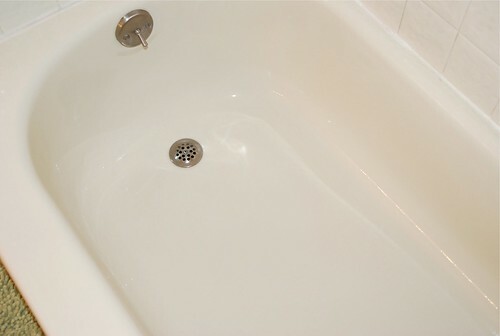 You can see the dirt ring in the tub in the photo below, this was after spraying the cleaner on and leaving it for about three minutes, it was melting the grime right off the tub. I made sure to have a window open, this smells super strong. 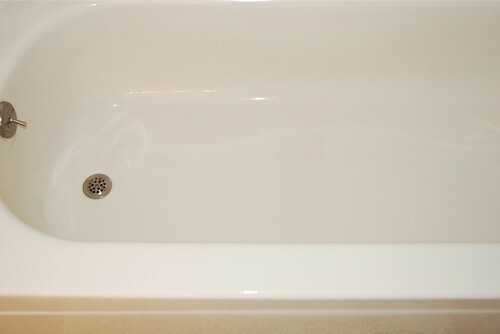 After the 15 minutes are up, rinse with hot water, you almost don’t even need to wipe it down. 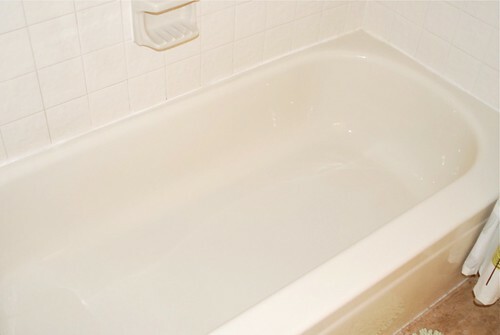 Believe me when I say the tub is now the cleanest thing in the house. I might serve dinner in here tonight because it’s that freaking clean.